WHY IS THE UPPER CERVICAL SPINE IMPORTANT FOR YOUR HEALTH ? The Atlas or first cervical vertebra weighs 3 to 4 ounces and supports the head which weighs 9 to 14 pounds. As a result the cervical spine is subject to mechanical stress and its alignment can easily be affected by minor trauma to the head and neck and poor posture. Malposition of the cervical spine often leads to further unbalance in the body, the lower spine and pelvis and for higher risk of neurological interference between the brain and its communication with the rest of the body. Also, structural posture and balance is often compromised. 1. Muscles work much harder to hold up the head which is off center. 2. There is potential interference and impedance surrounding the spinal cord and nerves that extend from the cervical region, which innervate and control your body functions. 3. 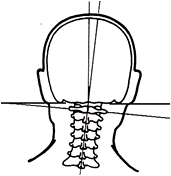 Various problems in the neck, mid back, low back and extremities may commonly occur in an attempt to compensate for atlas misalignment. Does the Atlas adjustment hurt? Unlike manipulative treatment, the Atlas Orthogonal (AO) instrument assisted adjustment is gentle and does NOT incorporate any popping, cracking or twisting of the neck or spine. How long will it take to notice changes after the adjustment? Most patients will begin feeling changes immediately and continue to improve as the course of care progresses. According to neurophysiological research, peripheral nerves that have been damaged or are significantly irritated may take 90 to 100 days to heal. The goal is for patients to maintain the atlas in proper alignment so nerves which control the functions of the body can function optimally.